One of the more enjoyable aspects of the promo work for my book, earlier this year, was crossing paths with other writers whose work I admire. One such was John Harvey. Connoisseurs of British crime fiction will know Harvey well, of course. In a lengthy and impressive career, taking in poetry, broadcasting and much else, John is, perhaps, most celebrated for his creation Detective Charlie Resnick, the Nottingham-based copper, who I can’t help thinking of as the English John Rebus. 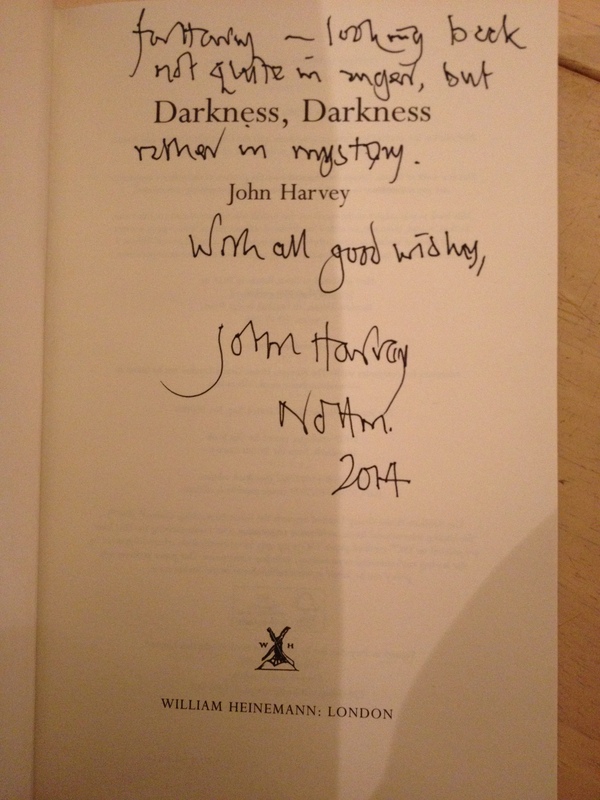 I met John in May when he was speaking at Waterstone’s in Nottingham about his final Resnick novel, Darkness, Darkness. I’d held a signing there myself, a couple of weeks previously, and the Events Manager, knowing of my fandom, generously furnished me with some tickets for John’s event. Mr. Harvey was a delight; witty, engaging and interesting. The event was pretty much sold out and he fielded a variety of questions from the punters before concluding with a long queue of eager readers clutching copies of Darkness, Darkness to be signed. My publisher, Ross Bradshaw, the Managing Editor of Five Leaves Publications (and, more recently, the proprietor of the thoroughly excellent independent and radical Five Leaves Bookshop) has had a long professional relationship with John. 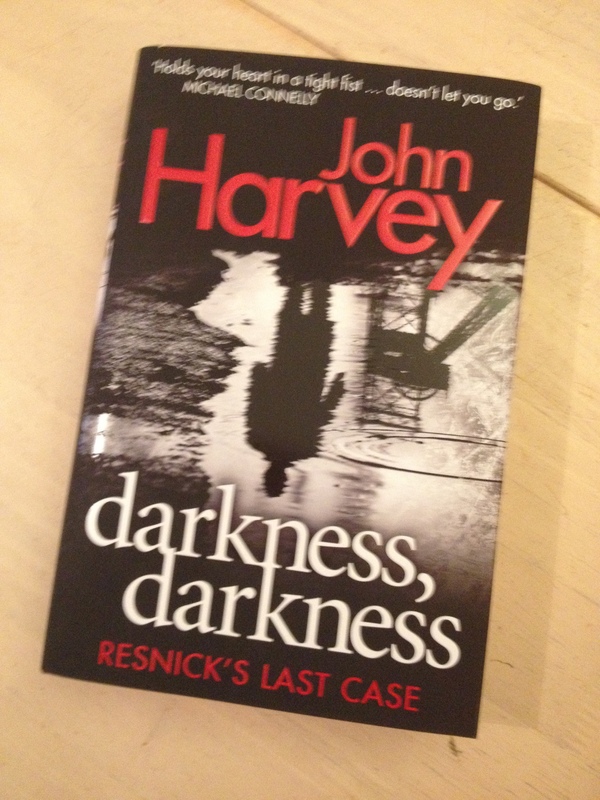 When the two did a couple of additional promo events in the County, Ross very kindly had John sign me a shiny 1st edition of Resnick’s last case and his dedication very kindly references my own book; a great honour! Of both personal and professional interest to me, the book is set during the miners’ strike, thirty years ago. The research is first-rate and John conveys an authentic and accurate flavour of the times. That said I was amused when Ross observed, “It’s not often I can say that I changed the course of literary history, but after I read a proof copy of John Harvey’s book I emailed him to say he had got a small but important detail of the aftermath of the 1984/85 Miners’ Strike in Nottinghamshire wrong and that he was not as conversant with the history of the local Robin Hood Railway Line as he could have been. It falls to me, then, to point out that both John and Ross still managed to miss a couple of things. Firstly, no Notts strikers marched back to work behind a brass band, with the Area firmly under the control of the scabs. And secondly, John cites the Area as having twenty-five pits; it actually had twenty-seven, at the time of the strike, with a further four workshops, making a total of thirty-one NUM Branches. Neither of which detracts from what is a superb swansong for Charlie Resnick. Nuanced, rich and beautifully evocative, Darkness, Darkness is easily among the finest British crime novels published this year. Highly recommend. Oh – the thing about the bands was one of those I wrote to John about. I thought he’d got it changed. Drat. Maybe I never changed the course of literary history after all. Or perhaps only a little. We’ll probably see the corrections in the 2nd edition, maybe.